For Loop Integrated Solutions, an asset-based logistics business located just 30-minutes from Speedway, Indiana – home to the famed Indianapolis 500 – the loop of continuous improvement is at the core of their amazing early business success. 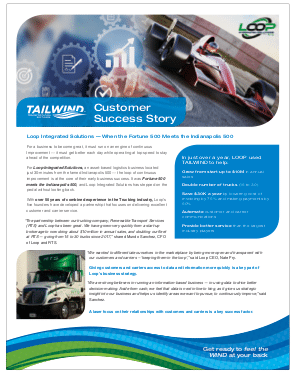 It was Fortune 500 meets the Indianapolis 500 – and Loop Integrated Solutions has stepped on the pedal without looking back. With over 50 years of combined experience in the Trucking industry, Loop’s five founders have developed a partnership that focuses on delivering excellent customer and carrier service. “The partnership between our trucking company, Renewable Transport Services (RTS) and Loop has been great for both of us. We have grown very quickly from a start-up brokerage to now doing about $10 million in annual sales, and doubling our fleet at RTS – going from 15 to 30 trucks since 2017,” shared Mundo Sanchez, CFO of Loop and RTS . Giving customers and carriers access to data and information more quickly, opening up lanes of communication, is a key part of Loop’s business strategy. “We are strong believers in running an information-based business – in using data to drive better decision making. Aside from cash, we feel that data is next in line to king, as it gives us strategic insight into our business and helps us identify areas we want to pursue, to continuously improve,” said Sanchez. A laser focus on their relationships with customers and carriers has also been a key success factor. “We knew that running a brokerage and having our own assets meant that we could be dedicated to customers AND flexible enough to adapt to changes in the marketplace – because you never can be sure where the market is going,” Fry shared. Loop knew they needed to gain insight from data, as well as share information externally with key stakeholders – so they looked for a TMS system that that could bring it all together and marry the operations and administrative sides of their business. A TMS that was flexible enough to fit their model, so that they could run Renewable Transport Services while building out a brokerage. They wanted a TMS that would do all this, be accessible over the web, and not break the bank, as they were a new brokerage and needed to manage cash flow tightly. Loop chose Tailwind’s SaaS-based transportation management software system. “I have to be honest with you – if you had asked me a year ago, I don’t know if I could have recommended Tailwind because we had such profound needs as to how we wanted to use information and operate our business. It was a bit of a rocky start. That said, I can’t emphasize just how responsive Tailwind and its customer service team has been to our needs – addressing both the depth and speed with which we moved – because remember, we were growing very, very fast. Now I can safely say, that we would recommend Tailwind to any small and emerging logistics company,” offered Sanchez. Coming from a Fortune 500 company (Eli Lilly), Sanchez brought the insight of a major corporation to a small business, and has applied tracking and measurement to all facets of the operation. He’s applied metrics to the cost of producing invoices and payments, as well as to the number of inquiries made by carriers. He’s analyzed the opportunity cost of labor that could be applied to higher-return activities by improving and automating internal processes. Loop utilized Tailwind’s Customer and Carrier portals and its open API (Application Programming Interface) architecture to customize the TMS’s capability with some of their own custom programming resources. They are now able to compete with some of the biggest players in the industry with their service value proposition. “We have built out our offering using the Tailwind TMS platform to the point where carriers are telling us that we are doing things better than some of the biggest players in the industry!” Sanchez continued. Loop has also built on the Tailwind API to extend its offering to their customers. “We were delighted to hear about the initiative that Loop took in extending their capability on our platform. 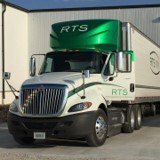 Being a true web–based business we feel that our API is a key piece of the unique value we offer customers,” said Murray Pratt, President & CEO of Tailwind Transportation Software. “I never want to be in a business where we think we know it all, or that our ego says that we have to do it all,” he added. “In that regard, I feel that our model is similar to Loop’s in that we strive to be open and transparent – wanting to do things WITH our clients, and not TO our clients,” said Pratt. And for Loop Integrated Systems, it is this mutually reinforcing loop that has driven much of its early success. The design of their eye-catching logo captures the essence of the Loop brand – and taps into the many layers of the word itself. From a loop that a truck takes on its route, to the information loop that keeps stakeholders in the know, to the loop of continuous improvement that is now a hallmark of Loop’s business success. “We strive to get better each and every day,” said Fry. And understanding that they are nowhere near the end of the race – a long way from getting the checkered flag – Loop still has the pedal down, coming up with ideas and offering suggestions to Tailwind on improving its application – from the administration workflow to portal enhancements. For Loop Integrated Solutions the race has just begun, and while they’re off to a fast start, they know that there is a long way to go. 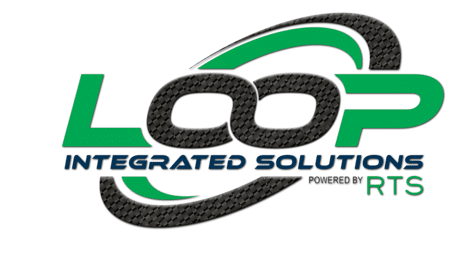 And while they’re past the ‘Start Your Engines’ point of their business and there are no yellow caution flags out for them at the old Brickyard raceway, Loop Integrated Solutions is off and driving hard – around and around the loop.